Right now, Iceland's new government is considering ending whaling, but they could face a mountain of backlash from the tycoon and his whaling lobby. 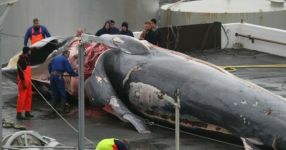 Tell Iceland: Stop the whale butcher! Scientists recently discovered cells in whales' brains that process complex emotions like romance and grief. These were thought to exist only in humans and great apes, but whales have up to three times more of them than humans! The whalers argue that there are plenty of fin whales around Iceland, but this is a globally endangered and protected species that was nearly hunted to extinction in the past century. And the cruelty is unbearable -- the exploding harpoons cause a slow, painful death. Millions of tourists flock to Iceland every year for its natural beauty and to watch whales playing in the wild. But visitors are left in shock when they see one of Loftsson's ships floating in bloody water, hauling a carcass. "Just tell them to look somewhere else. They can just turn around and look the other way," he says. Let’s show him that we won’t turn a blind eye to this massacre! Our movement has gone up against Loftsson's fleet before. When one of his whale meat shipments tried docking in the Netherlands, we pushed Dutch authorities to close their ports, and then Avaazers in Germany helped block ports there too! Now we have our best chance to stop his slaughter, for good. He just hacked her foetus out and trashed it. This Icelandic multi-millionaire has been slaughtering hundreds of endangered fin whales – many of them pregnant. But finally we can stop him!